One of the most frequent questions I get from folks is about dander or allergies they experience with their miniature schnauzers and other breeds as well. I have not had that problem with any of my schnauzers and here are the rules to keep your puppy and adult dog's coat thick, clean and dander free. 1. NEVER use oatmeal based shampoos. These shampoos tend to leave dander on the skin under the coat and over time create bacterial problems. The oatmeal based shampoos are too heavy for double coated dogs. a. Instead of oatmeal based shampoos, look for a citrus based shampoo. I buy my shampoo in bulk but for weekly bathing or bathing because my little ones have been playing in mud or dirt, I use a shampoo called Top Performance fresh pet sold at PetEdge on line...here is the link as they do have smaller containers. This shampoo needs to be diluted. 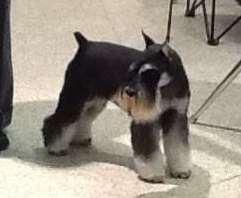 If you have constant problems with dander, odor or schnauzer bumps, then you must use a shampoo called Tar-iffic. In fact, I use this shampoo in the summer about once a month just to maintain the coat. It can only be purchased online and it is a miracle shampoo that can keep your babies off prednisone and keep the coats looking and smelling clean and healthy. When any of my schnauzers are finished being groomed, whether stripped or just shaved, I like to use a little bit of Avon Skin So Soft Oil on their coat. I put a few drops on my hands, rub together and rub over area especially around ears and face where the shaver might have gotten close and could cause a razor burn. Please email me at regenranch@aol.com if you have questions about your dogs coat or if you have questions you would like me to address on this forum. Next month I will address the chemicals we all put on our dogs to prevent fleas, ticks, heartworm etc and how these chemicals may effect your dog.